TARRC successfully exhibited at AAPEX 2013, at the Sands Expo Center, Las Vegas, Nevada from 5th - 7th November 2013. Exhibiting as 'Malaysian Rubber Automotive Products' and based on the Lobby Level Exhibit Hall, stand 9510 was well placed on the corner of the Auto International section, for AIA members only, and near the main entrance. This great location was ideal for a constant flow of traffic of visitors and potential new customers. TARRC's Gail Reader, who manned the stand along with David Cawthra, said "This event is now in its 21st year in Las Vegas and the sold out event attracts visitors and exhibitors from all over the world. AAPEX just seems to go from strength to strength year after year and this is why it is essential for us to be involved." 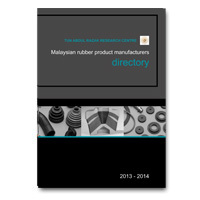 If you are looking to source high quality, competitively-priced rubber-based products and were unable to make it to the exhibition, then just let us know and we can send you a FREE 2013/2014 Directory of Malaysian automotive product exporters of parts, components & accessories.